With 20 years in the event industry we leave no detail overlooked. We offer full event planning and production for events up to 15,000 and beyond. With a full design team we can handle everything from inception to event branding, design, entertainment booking, vendor negotiation and management. 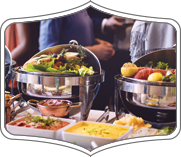 Our catering tops everything with cuisine that you guests will remember. 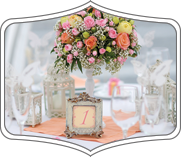 Event Planning Attention To DetailRight For Any OccasionWe take pride in having the best bar staff in the Denver | Boulder area. 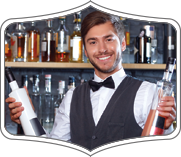 All of our bartenders are TIPS certified and bring life to your party. We are licensed and insured to work at any venue in Colorado. Our custom Colorado bartending services and beverage stations come equipped with everything you might need to throw a great party. Your bar tables will reflect your theme, colors and liquor selections. Full bars, bar tables and glassware can be rented. Our team of Mixologists will work with you one on one to find the right beverage.One Stop ShoppingWe offer full catering services with custom menu choices that can accommodate large events of any kind from non-profit dinners, corporate cocktail receptions and grand opening galas. Our culinary team sets the standard in off site events. We can set up custom built field kitchens to offer your guests the highest quality cuisine virtually anywhere in Colorado. With our highly trained staff and management every event we do we set a new standard. You are sure to appreciate our professional handling of every detail.